The Holiday season is upon us! There is a distinct chill in the air signaling the coming of the winter and the start of the busiest shopping season of the year. You have probably been marketing like crazy and preparing for Cyber Monday. Your stock is ready, your marketing is live, and you are ready for the influx of sales that comes with the season… The sales are coming in, but how can you convert those one-time sales into lifelong loyal customers? You want these sale shoppers to keep coming back and buying from you the rest of the year, and the easiest way to win customer loyalty is also the must understated. Handwritten Thank-You notes! Yup, these inexpensive and simple handwritten notes sent out to with each order can mean the difference between a one time sale, and repeated sales throughout the rest of the year! In this digital age, there is still something to be said about handwritten personalization. If you want to win over customers, you are going to need to go a little above and beyond to show that you truly do appreciate their purchase. The easiest, and most cost effective way to show your customers how much you care is to send a personalized handwritten thank-you note with every order that you ship out. Your customers want to feel special. They want to feel like their purchase meant something, and a simple thank-you note can really evoke positive feelings which the customer will remember. Remembering those positive feelings will make them more likely to purchase from your store in the future. I will say it again, people like to feel special and appreciated. A little bit goes a long way when it comes to earning customer loyalty. Your handwritten notes do not have to be super long and elaborate. Short and sweet is the way to go! A few things to remember though: use the customer’s first name, mention something specific to the products they purchased, and add in a little something extra. You can see a really simple example of what to write below. In this example the customer named Jessi purchased a Christmas Sweater from your boutique. I hope you absolutely love your Christmas sweater! We would love to see it on you. Share a picture on social media, tag us and use (our hashtag) and we would love to feature you! Have a wonderful season and don’t forget to keep checking back for all of our end of the year sales. See, short, sweet and too the point! The customer will feel special, and you may even have them sharing and promoting your business on social media now! Handwritten thank-you notes don’t need to cost a ton either! You can easily pick up some really cute blank cards at your local Dollar Tree, Walmart or Amazon that will be perfect for your business use. If you want personalized ones with your logo and letterhead, then by all means you should do that but don’t feel the need to go all out and make these cards a large added expense. People will appreciate the thought, and the fact they are handwritten no matter what the stationary looks like. In summation, if you want to win long term customer loyalty, make your customers feel valued and appreciated. 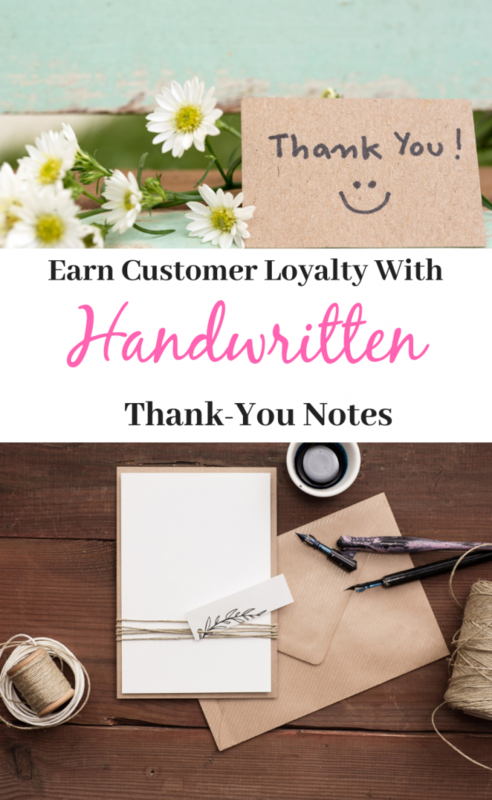 Handwritten notes can go a long way when it comes to making your customers remember you and want to purchase from your shop again in the future.